This Saturday we went over to Koen and Erica’s for dinner and to taste one fabulous shiraz from Mollydooker wineries that he picked up at Aixvinum in Aachen, Germany whilst on holidays “in the neighbourhood”. I suspected that their whole holiday was actually planned by Koen around this, but it actually wasn’t…. As you can see, we constructed a nice appetizer: Latkes with smoked salmon, crème fraîche and kazunoko (herring roe). The salmon was home smoked by a colleague of Koen’s and was really good. Good starter after opening the very nice Cuvée Christine brut that we brought home from Becker’s! 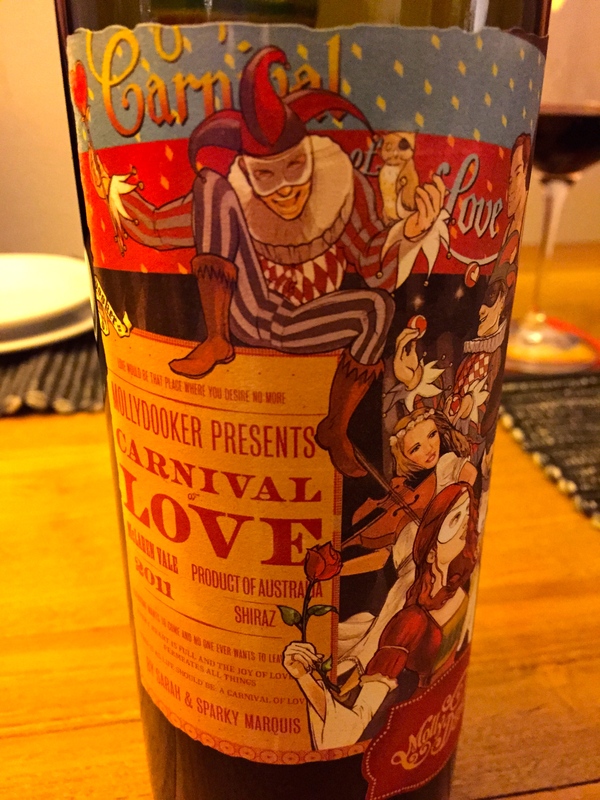 Even though the lamb was accompanied with a nice 2008 Chianti Classico Riserva from Antinori, the undeniable star of the evening was this 2011 Carnival of Love Shiraz by Mollydooker (McLaren Vale, Australia). Sarah and Sparky Marquis have been consistently producing top-notch wines for many years now and started their own Mollydooker winery in 2005. This Carnival of Love is getting rave reviews from Wine Advocate and Wine Spectator (up to 99 WA points!) and 93 WA points was their lowest ranking in their last 8 vintages. The 2012 Carnival of Love was actually awarded Wine Spectator’s #2 Best Wine in the World a couple of months ago.